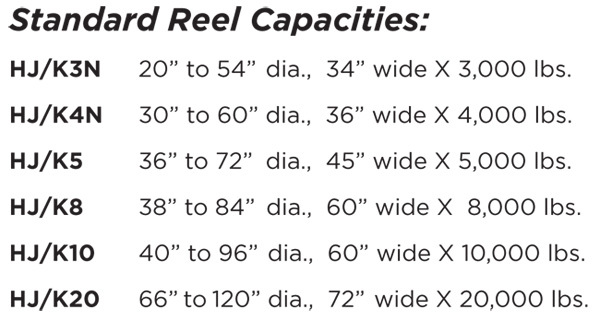 reels and material may be handled with ease, using minimum manpower. The HJ/K series is one of our most user-friendly solution for large diameter spooling and coiling applications. Moreover, it is a very cost-effective machine with good ROI. If you are looking boosting the efficiency of your reel and cable handling operations, then the HJ/K Series products prove to be the right choice. Features such as hydraulic jack, slide drive (optional), 1700 measurer and HD mechanical drive ensures that the reels and other materials are handled with care and ease, limiting the use of manpower. This machine is a perfect blend of efficient design, operation and safety.HJ/K Mobile Reeling & Coiling Machinery makes reeling foam, coiling foam, reeling tubing, reeling rope, reeling chain, coiling tubing, coiling rope, coiling chain and other reeling and coiling operations efficient. HJ/K series mobile reeling and coiling machine is a practical and economical solution for large diameter spooling and coiling applications. The HJ/K can improve the efficiency of your reel and cable handling operation. By utilizing a hydraulic jack (standard), slide drive (optional), 1700 measurer and HD mechanical drive, reels and material may be handled with ease, using minimum manpower. It is well built reeling machine.